Into Blinds is one of the largest retailers of custom shutters and blinds in Melbourne. Innovative in their approach, Into Blinds stay ahead of the competition by delivering outstanding advice, quality and customer service. 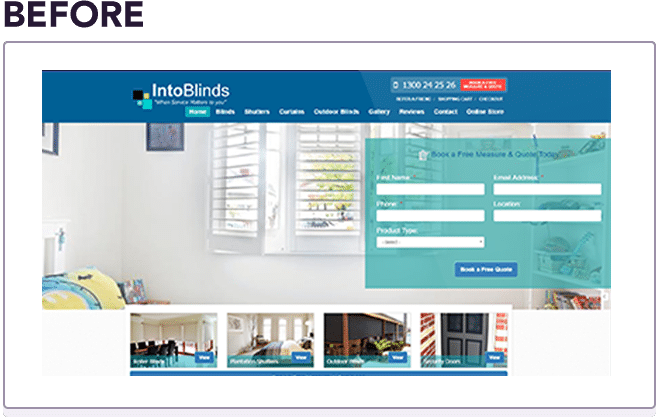 When Conversionry was approached by the Into Blinds team, their sales had never been higher – they had already succeeded in dominating their industry’s SEO and online marketing, reeling in record numbers in traffic. So what could Conversionry do? 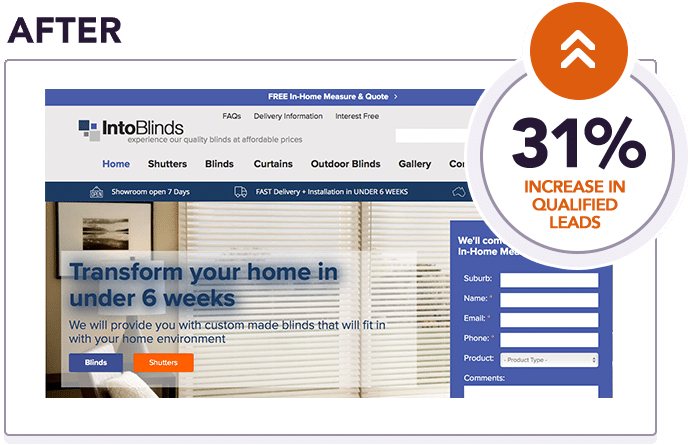 Into Blinds came to us wanting to increase their website’s conversion rate – in other words, to get more leads from existing traffic. Our challenge was to get even greater potential from the website while protecting search engine rankings. One wrong move during AB testing would mean hundreds of thousands of dollars lost in a matter of days. They needed an intricate and precisely delivered Conversion Optimisation program. During the kick-off CRO Workshop we asked the Into Blinds team specific questions to understand what drives their customers’ purchase behaviour in-store, in order to better understanding the data we gather from the website. Straight away we knew their key strengths that weren’t leveraged and promoted enough on their website. After reconfiguring the website’s analytics to measure the right conversions, we were able to see an accurate conversion rate and total number of leads (form submissions + phone calls), and set KPIs to work towards. Strictly following our rigorous scientific method was the key in uncovering conversion problems on Category pages and Product pages. We developed prioritised hypotheses and AB tests that we mathematically predicted would bring the highest revenue impact, and put them to work. We worked closely with Into Blinds’ SEO team to include measures to protect Google rankings during AB testing. The AB testing resulted in a 107% increase in Conversion Rate, and during the AB testing period of January 2018, Into Blinds had a record number of enquiries. After 4 weeks of exposing traffic to permanent changes, the result was a 31% increase in Number of Leads (Form submissions + Phone calls). The Into Blinds team and management were wrapped with the result and so were we! Into Blinds wanted to continue this culture of experimentation and commissioned Conversionry to continue with ongoing monthly optimisation & testing. We are pleased to report that Into Blinds’ conversion rate and number of leads continues to increase every month. 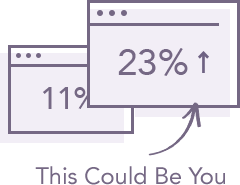 A 107% increase in Conversion Rate.